It’s easy to get carried away with elaborate and expensive home automation projects when you’re just starting out. A better place to begin though, is with a simple, temporary setup that doesn’t cost a lot but will still give you a glimpse of some of the conveniences of home automation without making a big commitment. 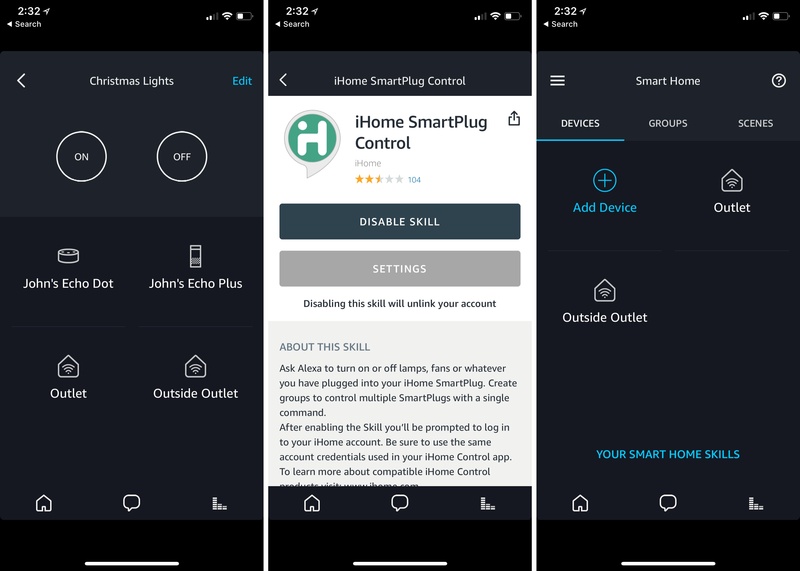 When I heard that iHome had introduced a reasonably-priced outdoor smart plug, I knew immediately that it and some holiday lights would make an excellent home automation starter project. This is by no means a Clark Griswold-level undertaking. My family’s holiday decorations are fairly simple. 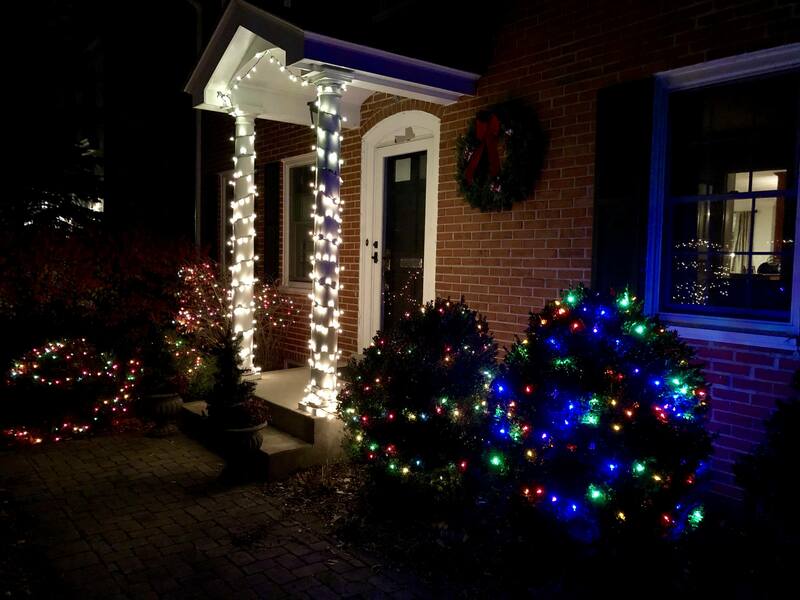 In the front yard, we put up lights in the bushes and on the columns on either side of our front door. Inside, we have a Christmas tree in our living room with lights. The first step was to put up the outdoor lights the weekend after Thanksgiving on what turned out to be a mercifully warm day. After the lights were up and working, I plugged them into the iHome’s iSP100 Outdoor SmartPlug, which I connected to an outdoor outlet near my front door. The iSP100 is about as simple as you can imagine. It has a short cord attached to a plastic box that holds its electronics. One end plugs into a standard US outdoor electrical outlet, and the other end takes two or three-pronged electrical devices. 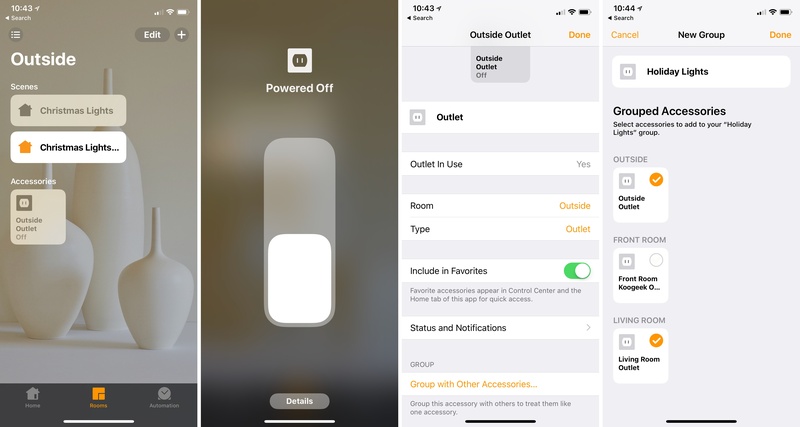 Next, I opened Apple’s Home app, tapped the plus button and picked ‘Add Accessory.’ Scanning the HomeKit code on the side of the iSP100 was a little awkward because the outlet was close to the ground, and it was a bright, sunny day, but after a few tries, the code was recognized. However, the Home app refused to add the plug. The process of doing this while stooped over in front of my house quickly tried my patience, so I took the SmartPlug inside and set it up in the kitchen where I didn’t have to bend over, and I had a better WiFi signal. This time, setup was quick and painless. With the SmartPlug available in the Home app, I moved it outside and tested it by turning the lights on and off with the ‘Outside Outlet’ buttons I had created. The last step was to set up two automations. The first turns the SmartPlug on at sundown and the second turns it off at 11:00 pm. Setting up automations to turn my holiday lights on and off. The following weekend, we bought a Christmas tree. After the lights were on the tree, I plugged them into an iHome iSP8 Indoor SmartPlug that I picked up during a Black Friday sale. After adding the iSP8 to the Home app, I included it in the automations that I had created for the outdoor lights. Now, like magic, our Christmas lights come on simultaneously at sunset in our living room and the front yard. I prefer to control HomeKit devices from Apple’s Home app because it’s easier than going to multiple manufacturers’ apps to manage devices. 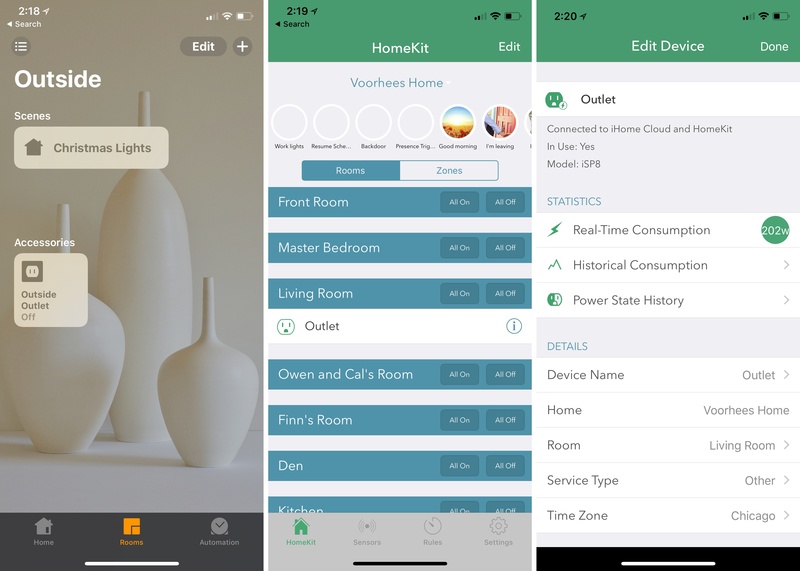 The Home app is also better-designed and easier to use than most of those apps. The iHome app is no exception. The UI is unattractive and assumes you want to see a list of every room in your home even if you have only one or two iHome devices. There is one cool feature of the iSP8 has that you can’t access in Apple’s Home app though, which is why the iHome app remains on my iPhone. If you tap the info button next to the iSP8, it displays the plug’s electrical usage. I knew Christmas lights use a fair amount of power, but was surprised to learn our medium-size tree is using around 200W. You can also view the cost of that electricity based on historical prices for your area over different time periods. It’s a neat feature that I wish the Outdoor SmartPlug had too. The Apple Home app (left), the iHome app (center), and the iHome app's electrical usage feature. Although scheduling our holiday lights to turn on and off at set times is probably all I needed to do, I wanted to take things a step further and test Siri and Alexa integration. I’m glad I did because the two assistants work in subtly different ways that my simple setup highlights. Scenes work a little differently though. Initially, I created a Scene called Christmas Lights that includes both iHome accessories in their ‘on’ states. Tapping the Scene from the Home app or in Control Center turned on my lights, and I could toggle them back off by tapping the button again. Turning on lights in a Scene (left), turning off lights with a different Scene (center), Siri can't turn off a Scene (right). That doesn’t work with Siri though, because it can’t turn off scenes. 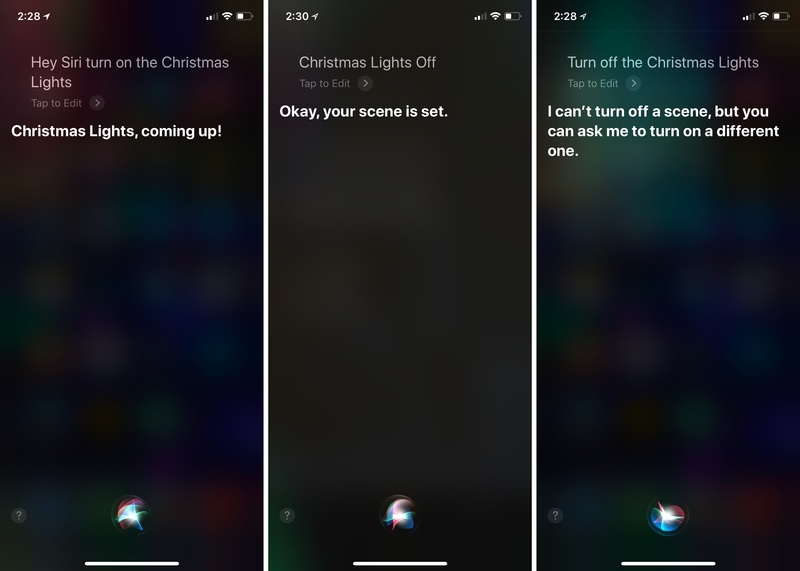 That meant that I could say ‘Hey Siri, turn on Christmas Lights’ to turn on the Scene, but I got an error when I asked Siri to turn the Scene off. One solution is to create a second Scene that is identical to the first, but with the iHome plugs in their ‘off’ states. 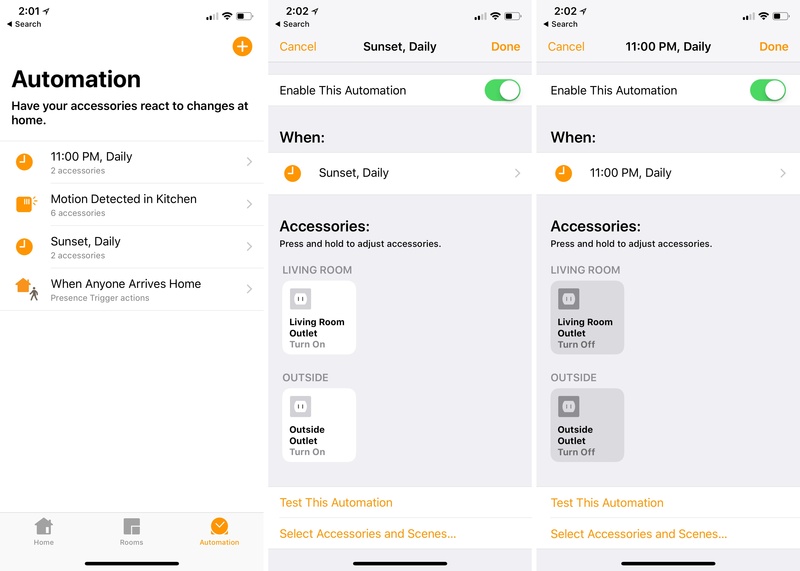 The difference between how Scenes are activated and deactivated in the Home app and with Siri is a quirky distinction that has led to a lot of user confusion judging from posts online. To add to the confusion, what I first unsuccessfully tried to accomplish with a Scene, is possible with a Group. Unlike Scenes, which allow device-level control over each accessory in the Scene, settings for Groups apply to the set of devices only. For example, if you include a Hue light and power outlet in a Scene, you can set the brightness of the light and its color temperature while also setting the outlet’s power state to on or off. If you include the same accessories in a Group, however, you can only control whether the light and outlet are on or off because that’s the only setting the two have in common. The advantage of a Group over a Scene though is that Siri can turn a Group on and off. HomeKit Group creation is buried deep in Apple's Home app. The problem is compounded by the fact that Groups are not clearly exposed in the Home app’s UI. To create one, you need to 3D Touch an accessory’s icon in the Home app, then tap ‘Details.’ Near the bottom of the screen is an option to ‘Group with Other Accessories,’ which you can use to create and name a Group. In a tab bar app that has only three tabs, Groups strikes me as a feature that Apple should promote to its own tab as Matthias Hochgatterer has done in his excellent third-party Home app. Amazon’s handling of grouped accessories is a little more straight-forward, but the setup process is tedious. The Alexa app is a poorly designed, confusing mess. To control my iHome devices, I had to download the iHome skill, set up an iHome account, log in, and add each device to the Alexa app. After that was finished, I included both iHome plugs in a group I named ‘Christmas Lights,’ which worked just like my HomeKit Group. Setting up my holiday lights in Amazon's Alexa app. Now that I have HomeKit and Alexa Groups with the same name, I can tell Siri or Alexa to turn my Christmas lights on or off with the same command. In my tests, neither voice assistant worked substantially better than the other. The Echo seems to respond a little faster, and Siri is more chatty, but the differences are too small to declare a clear winner. Overall though, I give the edge to Apple because I can also control my holiday lights with my Apple Watch and the Home app is vastly superior to Amazon’s. Setting up holiday light automation was instructive in a couple of ways. First, I went into the project wondering whether automating something so simple was worthwhile. After all, it’s not hard to manually plug in your lights. I was surprised to discover though that I’ve enjoyed having my lights automated. It’s a small difference, but our lights come on without having to think about it and regardless of whether we are home. The setup is better than an analog timer too because I can turn the lights on and off whenever I want without wondering if I’ve messed up the timer somehow. Second, I have a greater appreciation for the design of Apple’s Home app every time I set up a new smart device. It has some quirks and limitations, but the Home app is far ahead of most device manufacturers’ apps and the Alexa app. It’s still early days in home automation. Consequently, it pays to move slowly and carefully consider your options before taking the plunge with expensive hardware. One of the benefits of iHome’s smart plugs is that they work with HomeKit, Alexa, Google Home, Nest, Smart Things, and Wink. That sort of cross-platform compatibility can come at a higher price, but it also ensures you’ll have the greatest possible flexibility as your home automation system evolves. The iHome iSP100 Outdoor SmartPlug, which is $40, and the iSP8 Indoor SmartPlug, which is $45, are available from Amazon.